Africa: USA-Africa - No Policy? Bad Policy? or Both? From left, Presidents Jacob Zuma, Muhammadu Buhari and Donald Trump. The headline to Page's article in Quartz Africa states that "Donald Trump could be getting his US-Africa policy right by simply not having one." His view is actually more nuanced, in judging that no policy would likely be only "less bad" than explicitly "bad policy" that might result from greater White House interest in Africa. There is no doubt, however, that analysts are left to speculate about how much personnel appointments might actually shape Africa decisions on the ground. This AfricaFocus Bulletin contains three well-informed articles analyzing the state of play in Africa-related personnel appointments under this administration, including this one by Matthew Page, until recently the U.S. intelligence community's top expert on Nigeria (see his website http://www.nigeriaknowledge.com/), as well as commentaries by Richard Dowden of the Royal African Institute and Reed Kramer of AllAfrica.com. Although the notion of a unified "Africa" policy is largely a fiction under any administration, there is no doubt that the Trump administration is unusually bereft of authority and personnel at the State Department, which has the task of making sense of the policies of different departments and providing local knowledge to adapt policy to Africa-specific realities and changing circumstances. In general, the incoherence of policy making under Trump, rapid staff turnover in his immediate entourage, lack of staffing in government agencies, and the ongoing investigations into his administration make even the immediate future of any foreign policy highly uncertain. It is also highly debatable whether continuity of policy guided by knowledgeable "adults" rather than zealots would actually produce "good policy." That said, the consequences for Africa of U.S. global policy on climate change, counter-terrorism, health, corruption and illicit financial flow, human rights norms, and development goals, to name only a few such areas, will inevitably have fallout effects for Africa. These effects will surely be as great as, or greater than, the impact of policy decisions on Africa-specific issues. And the policy directions on domestic issues across the U.S. Government will set the context for each agency's international engagement in Africa as well as in multilateral institutions. Thus it is quite possible to have no policy on "Africa" and disastrously worse policies than the "less bad" (continuity) policies of previous administrations. As readers are aware, AfricaFocus particularly features such issues on which global and U.S. policy has particularly negative effects on Africa. This AfricaFocus Bulletin accordingly includes below a partial list of issues and cabinet officials who are shaping U.S. policy, with brief references to AfricaFocus coverage and a few other additional links from current news sources. "Retired senior diplomat & ex U.S. ambassador to #Ethiopia Don Yamamoto to be acting Assistant Secretary for #Africa @StateDept. Starts Sep 5"
"Appointment of 'acting' Assistant Sec likely means no nominee for top #Africa post @StateDept soon. Senate opposition blocking Peter Pham." Last week, secretary of state Rex Tillerson made one of his rare press appearances to give a tour d'horizon of US foreign policy priorities. In his lengthy and candid remarks he touched on North Korea, China, Syria, Ukraine, and Venezuela, among other issues-but made no mention of Africa. This omission reflects the reality that Africa is terra incognita for the Trump Administration: a continent it cares little--and understands even less--about. With no dyed-in-the-wool Trumpian Africa hands available, the administration appears ready to cede Africa policy making to career civil servants and a few mainstream Republican appointees. Guided by this team of low-key professionals, could president Trump's Africa policy turn out to be more pragmatic than extreme? Could it steer clear of Trump's trademark controversies and missteps? Many of the signs point to yes: with luck, bureaucratic effort, and Congressional top cover, US Africa policy under Trump might remain relatively fumble-free. 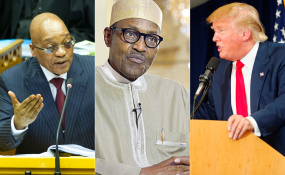 During Trump's first six months in office, US-Africa policy has been adrift. At no time since before the creation of the State Department's Africa Bureau in 1958--a time when most African nations were still European colonies--has Washington been so distracted and disengaged. Prospective budget and organizational cuts suggest Trump--unlike George W. Bush--does not see promoting good governance, human rights, and socioeconomic development as a strategic US interest. Trump's senior officials reportedly do not take Africa-related issues seriously, urging subordinates to keep them off their plate. They have thus far shown little interest in engaging with African countries beyond making business deals and leveraging military ties. Perhaps because of this ambivalence, ambassador John Campbell's prediction last December that "career civil servants and diplomats, together with Congress, will play a big role in setting policy" has largely borne out. Key Republican senators derisively view secretary Tillerson's proposal to make deep discretionary cuts to his department; Democrats call Tillerson's plan "a devastating assault on American interests and values". Congressional pushback from Republican Africa stalwarts like Sen. Jeff Flake, and Rep. Ed Royce and Rep. Chris Smith will also intensify if Trump tries to undermine longstanding bipartisan programs, like the President's Emergency Fund for AIDS Relief (PEPFAR). Congress will also weigh in on Trump's forthcoming Africa appointments. At least one of these appointments--Trump's new senior director for Africa Cyril Sartor--started work at the National Security Council last week. After a painful ten monthlong vacancy, Sartor--a dour but Africa-savvy CIA mandarin-stepped into the breach. Tasked with advising senior administration officials and coordinating interagency decision-making on Africa, Sartor is a veteran bureaucratic gladiator that will resist any effort to politicize his portfolio. Beyond naming Sartor, the Trump administration has failed to fill out its Africa team. At the State Department, the job of assistant secretary of state for African Affairs remains unfilled. Career diplomat Peter Barlerin-a trained economist that has yet to serve as an ambassador-has been treading water as Acting Assistant Secretary for several months. As a result, the Bureau and its 45 embassies across Africa continue to operate much as they did before with little--if any--new country-specific guidance. The likeliest candidate for assistant secretary is Vatican-diplomat-turned-Africawonk Dr. J. Peter Pham. A prolific writer with a hard-nosed Africa policy strategy ready to go, Pham lacks strong ties to his prospective boss. Secretary Tillerson reportedly has vacillated over naming Pham, despite his preeminence among the GOP's miniscule cadre of Africanists. At the Department of Defense (DOD), seasoned civil servant Amanda Dory stepped down as deputy assistant secretary of Defense for Africa earlier this year. Dory's unexpected departure thrust her newly-minted deputy Michelle Lenihan into an acting role. On the military side, Air Force Major General Curtis L. Williams recently became chairman of the joint chief's in-house Africa advisor. Over at the embattled US Agency for International Development (USAID)-still in danger of being dismantled by Trump-career professional Cheryl L. Anderson has been Acting Assistant Administrator for Africa. Newly confirmed USAID administrator Mark Green, a widely respected former ambassador to Tanzania, likely will pick her replacement soon. As new appointees slowly come on board, US-Africa policy will regain some of its shape and direction. Less liberal and ambitious than under previous administrations, its focus on democracy, development, and human rights will diminish. Guided by apolitical professionals, it almost certainly will not reflect Trump's bigoted, antihumanist world view. But what if Trump tries to dabble in Africa policymaking? How would these policy professionals cope? After all, Trump's penchant for praising autocratic leaders could, for example, complicate efforts by US officials to nudge the continent's strongmen leaders to relinquish power and hold credible elections. Trump's 'hashtag diplomacy' could also spark an international incident. If Trump and his top lieutenants continue to show as little interest in Africa as they do now, the chance of one of these scenarios playing out seems remote. If this dynamic changes, however, Washington's beleaguered Africa policymakers will have just one option left: damage control. Peter Pham: President Trump's perfect pick for top Africa post? Richard Dowden is the director of the Royal African Society and the author of Africa: Altered States, Ordinary Miracles. If Pham becomes Assistant Secretary of State for Africa, it would likely mark a shift in the tone and priorities of US-Africa relations. If Donald Trump has a to-do list and Africa is on it, it must come a long way down. It is seemingly impossible to find anyone on his team that has an interest in the continent. And the crucial position of Assistant Secretary of State for Africa remains empty, though perhaps not for much longer. Over six months into his administration, there are growing noises suggesting the US president may finally be ready to put forward a name for the government's top Africa post. J. Peter Pham's name has already been doing the rounds as the most likely candidate. He is director of the Atlantic Council's Africa Centre and a prolific former academic with close links to the Republican Party. A one-time Washington outsider who challenged the consensus on US-Africa relations, Pham has reportedly been trying to broaden his connections in departments whose staffs are more likely to lean Democrat than Republican. He is working hard to establish relationships with experts across the spectrum, trying to build a policy consensus. Pham has written profusely on Africa and rejects the previous approach - espoused by Bill Clinton, George W. Bush and Barack Obama - that insisted democracy and human rights should be the cornerstone of US support. Instead, he argues that economic growth should take precedence, though he has recently emphasised security and good governance too. He urges US companies to grasp business opportunities on the continent. This approach may suit Trump well, though if appointed, Pham will be hard-pressed in trying to work out exactly what his boss' Africa policy is. Previous US presidents have typically talked the talk regarding respect for human rights, democratic accountability and a free civil society when it comes to Africa. But Trump is from a different planet. His policy-light "America First" agenda, his incontinent outbursts, and his wilful ignorance about the world make it difficult to understand what he might want from the continent. The content of his phone calls to half a dozen African presidents meanwhile have not been made public. Access to oil seems to be one of Trump's priorities, so Angola, Equatorial Guinea and Nigeria may be important. Though less so their democratic and human rights records. This uncertainty will mean that Pham's job, if he gets it, will not be easy. In fact, the language of the current administration is reminiscent of America's mood in the 1980s. At that time, a senior unnamed US official told historian Niall Ferguson: "The judicious study of discernible reality is not the way the world really works any more. We're an empire now, and when we act we create our own reality." This sounds close to Trump's dismissal of reality as "Fake News" and his programme of creating new realities. The US has a number of large-scale projects in Africa. Its power to enhance or undermine national economies and governments remains immense. Militarily, the US military command known as Africom has bases across the continent and engages in the training of soldiers, especially in the Sahel where Islamist militant groups operate. Tackling this security threat was a priority in Trump's campaign. It has also been identified by Pham as an area of possible bipartisan support in which the US can forge ahead. Another crucial programme in Africa is the President's Emergency Plan for AIDS Relief (Pepfar) through which the US has spent billions each year since 2003. Started under Bush Jr. and extended by Obama, the programme today supports around 11.5 million people with life-saving antiretroviral medicines. The US government recently agreed to maintain current levels of spending in 2018 despite the White House's attempts to cut it back. The US also sees Africa as a source of raw materials and a trading partner. The African Growth and Opportunities Act (AGOA), first signed into law in 2000, provides a framework for this commerce and offers certain trade preferences for African countries. In 2016, US imports from sub-Saharan Africa under AGOA totalled $9.3 billion, 56% of which was petroleum products. In the opposite direction, Pham wants to create more demand for American products on the continent and believes that "advancing US economic interests in Africa will, and must be, driven primarily by the private sector". Pham says he wants Africa to take control of its destiny. But whether that means helping African states reach a mutually beneficial relationship with the US is not clear. He talks of "earned engagement" with the US, implying that African governments must first win America's respect, or at least its favour. He preaches stability and economic growth over democracy and human rights. And he insists that the US must correct its long-held and "overly optimistic notions of what African partners are capable of and willing to do". If Pham takes charge as many are expecting him to, it would likely mark a significant shift in the priorities and principles typically espoused by the US in dealing with Africa. The space for discussion and negotiation open to African governments would likely narrow even further. And under Pham, it seems policies would not be crafted alongside African leaders and their people, but unapologetically designed to fit the needs of Trump's America. For the president, his appointment may make perfect sense. After two abandoned attempts to fill the highest Africa position in the White House, the Trump team is considering a career intelligence officer. No announcement has been made, but sources with access to the selection process say Cyril Sartor, deputy assistant director for Africa at the Central Intelligence Agency (CIA), is the front runner to be senior director for Africa at the National Security Council (NSC). On April 1, AllAfrica was the first to report the choice of Air Force veteran and former Pentagon Africa counter-terrorism director Rudolf Atallah for the NSC Africa job. Buzz Feed, which wrote about the Atallah selection 12 days later, reported on June 23 that the offer to Atallah had been "yanked" - after he had been introduced at an 'all-hands' NSC meeting and had been actively working on African issues for the administration. No reason has been advanced for the reversal on Atallah, who was the second person named to direct Africa at NSC. The first, Robin Townley, was blocked from taking the job after his security clearance reportedly was rejected by the CIA. Among the positions Sartor has held, according to a brief biography posted online by the Aspen Security Forum in July 2016, are serving as briefer for two National Security Advisors and as acting intelligence officer for Africa at the National Intelligence Council (NIC), which produces strategic forecasts for the U.S. government. The bio says he earned an MA in African History from Boston University in 1984. Sartor is among the small group of African Americans at senior level in the intelligence community. No official government biography is available online. The information posted by Aspen accompanied Sartor's participation in a public panel on terrorism in Africa at the Aspen forum in July 2016, a relatively rare appearance by an intelligence analyst. "It feels a little weird for a CIA officer to be live streaming on YouTube," Sartor joked, as he began his prepared remarks. "Violent Islamic ideology is a foreign import to sub-Saharan Africa and as such it only thrives where it can co-opt local grievances," Sartor said, citing complaints among nomadic Tuareg people in Mali and "clan frustrations" that spur the insurgency in Somalia. The socioeconomic roots of popular grievances must be addressed, he told the Forum, adding, "I sincerely believe the international community can defeat terrorism in sub Saharan Africa with a robust mix of long-term development and security assistance." He said defeating terrorism in Africa "will take a long time" - in part because insurgencies typically last "more than a dozen years" and also because the youth population across Africa is growing faster than anywhere else in the world. Africa director at NSC is one of two high-level Africa jobs that remain unfilled more than five months into the Trump administration. No formal nomination has been put forward to head the Africa Bureau at the State Department, a front-line position tasked with managing U.S. diplomatic relations with the continent. Africa experts who track policy developments believe a nomination for the senior Africa post at State could be nearing. The choice for Assistant Secretary for European and Eurasian was announced on July 19 - only the third nomination to date for one of the 22 assistant secretary positions in the department. After several names were discussed within the administration to be nominated as Assistant Secretary of State for Africa, well-connected sources say that J. Peter Pham, director of the Africa Center at the Atlantic Council, is being vetted and that his name could be one of the next submitted by the White House to the Senate for confirmation. Grant T. Harris, who was senior director for African Affairs in the Obama White House, sees 'de-prioritization' of Africa by the Trump administration as creating an opening In Africa for other powers. "Chinese leaders must be salivating" - the country now takes in $50 billion a year or more from African investments, he wrote in The Hill. "North Korea has sold weapons to African countries, in violation of UN sanctions, to fund its weapons of mass destruction programs, and Russia is looking to Africa to hedge against U.S. sanctions," he wrote. Peter Pham, the presumed nominee to head the Africa Bureau at the State Department, is a prolific author of analytical essays and books whose work has focused on African security issues. He prepared a strategy paper published by the Council and submitted to the Trump transition team in December, which advocated - among other recommendations -reassigning four north African nations (Libya, Tunisia, Algeria and Morocco) to the Africa Bureau at the State Department, where they currently fall under the Bureau of of Near Eastern Affairs. This reorganization took place at the NSC soon after Trump assumed office. In a blog he wrote in January, Pham gave this assessment of how the U.S. needs to respond to the proposed German 'Marshall Plan' for Africa. "If the United States is to pursue a foreign policy of America First, then there is a lot of catching up to be done in bringing the public and private sectors together to forge a robust US approach to the new Africa, whose rising geopolitical importance and burgeoning economic dynamism ought to make it a strategic priority in the new administration." Security and Peacekeeping (James N. Mattis, Defense Secretary; H.R.